There are people who specifically target vulnerable members of society, and that’s an unfortunate but true fact. There are other dangers of living alone as well because on average, seniors are less able, either mentally or physically. 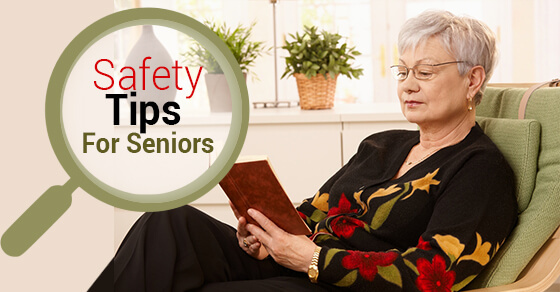 With some planning and new habits, seniors can protect themselves and make their homes a safe place to live. Making a home or community safer happens when criminals choose not to target that spot. Having a community safety program will help, and that doesn’t even need a permit or initiation from an external group. An informal safety net functions by communicating with neighbours you trust — everyone involved should be willing to help others as much as they receive assistance themselves. Home security systems and CCTVs are a huge deterrent as criminals don’t want evidence of their crime, in case they get caught. Many seniors are independent enough to take care of themselves most of the time, when they are given the tools and supplies they need. Prevention will be key in order to avoid problems that could spiral out of control, and that’s why you need feedback in order to make sure that things are running smoothly. A video stream of common areas in the home of a senior can help with early detection of developing issues, although verbal feedback from neighbours, cleaners, and other people coming into regular contact with the senior is good information to have. You may want to consider getting support from a caretaker who can also act as part of the senior’s social network. It’s important for seniors to stay updated when it comes to possible dangers such as health risks and scams. Reading the news, newsletters on health issues relating to seniors, and talking to health care experts will help them stay current, while other sources for information include police alerts, community centres, and outreach programs. Security systems can be installed that can help in reminding those in the house to do some of these items, and can alert others when they haven’t been done, or aren’t done on time. A senior without any assistance can be incredibly helpless. If you’re in a position to assist an elderly person, there are many opportunities to do so. A home CCTV system and security system is very affordable, so call us with any inquiry.